Want to spread the word about your favorite sweet spud? Below we have provided talking points for you to use with customer education, community engagement and social media posts. We’ve also built a customizable pitch for you to share with your local media throughout the year to secure on-air interviews and/or quotes in local publications. Did you know that North Carolina is the No. 1 sweet potato producing state in the United States? Even more, the state has held the title for almost 45 years! An online research survey found that 4 in 10 consumers think sweet potatoes are exclusively a winter food. Famous for their long-standing appearance on holiday dinner tables, most are surprised to find that sweet potatoes are actually a year-round vegetable. The 52 Ways to Love Sweet Potatoes initiative’s goal is to educate consumers about the versatility of sweet potatoes and expand their usage repertoire to include more quickly prepared, easy and family-friendly ways to serve them. Further, 52 Ways seeks to raise consumer awareness about the many health benefits of sweet potatoes and the nutritional value of including them more frequently in home meals. February is National Sweet Potato Month. Let’s celebrate our favorite sweet spud! A medium sweet potato has only 103 calories when baked in its skin. A medium sweet potato has 4 grams of dietary fiber. Sweet potatoes provide vitamins A and C, manganese, potassium and antioxidants. North Carolina is the No. 1 sweet potato producing state in the United States, contributing to 50% of the nation’s sweet potato supply. Sweet potatoes are as American as apple pie! Native Americans were growing sweet potatoes when Columbus came in 1492. There are hundreds of types of sweet potatoes ranging from white and mild to deep red and super sweet. When selecting sweet potatoes, it is important that the sweet potato is firm to the touch and shows no signs of decay. For even cooking, choose sweet potatoes that are uniform in shape. 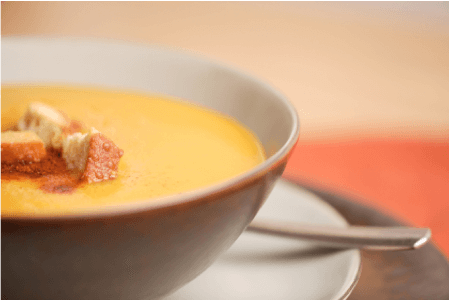 Commonly known as a winter comfort food, sweet potatoes are actually available year round! Our 52 Ways to Love Sweet Potatoes shares the versatility and health benefits of NC sweet potatoes while encouraging families to eat NC sweet potatoes at least once a week. With their delicious sweetness and mild flavor, sweet potatoes take to a variety of ethnic seasonings, making them a go-to ingredient no matter what the dish. From hearty chili to curry soup, dumplings to chicken pot pie – there isn’t a dish where sweet potatoes don’t fit! 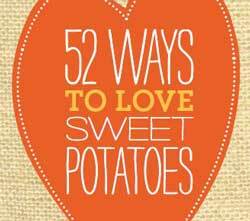 Our fun 52 Ways to Love Sweet Potatoes calendar shares a delicious sweet potato recipe for every week of the year! Share with your consumers to increase awareness of sweet potato’s versatility and nutritional benefits and encourage families to eat NC sweet potatoes at least once a week. To share with your community, colleagues and customers, download the PDF or feel free to reference our digital version as well.